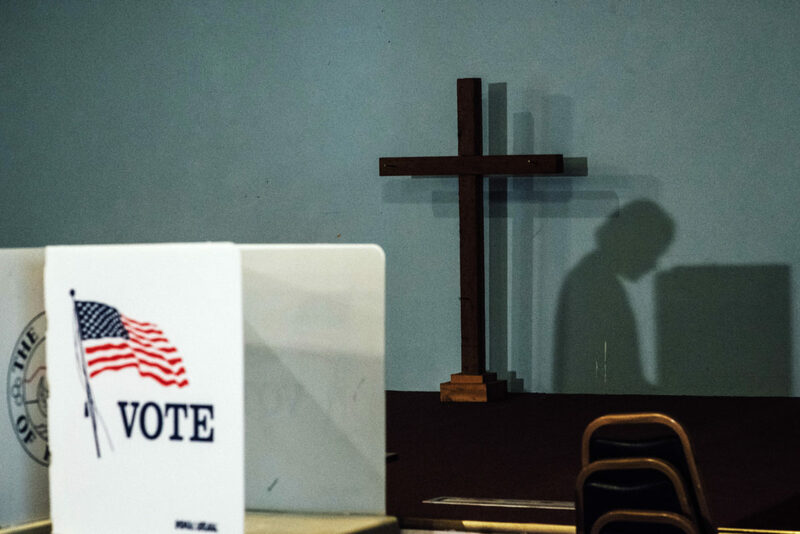 A man votes at The Orchard Bible Fellowship in Kingsburg in California's 21st Congressional district. 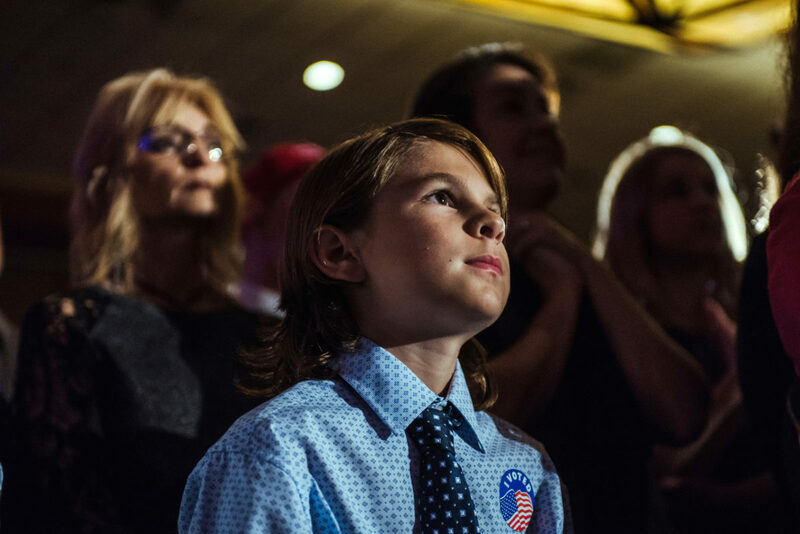 Corbin Collins, 10, watches as Josh Hawley is announced as Senator-elect at the election party for Josh Hawley at the University Plaza Convention Center in Springfield, Missouri. 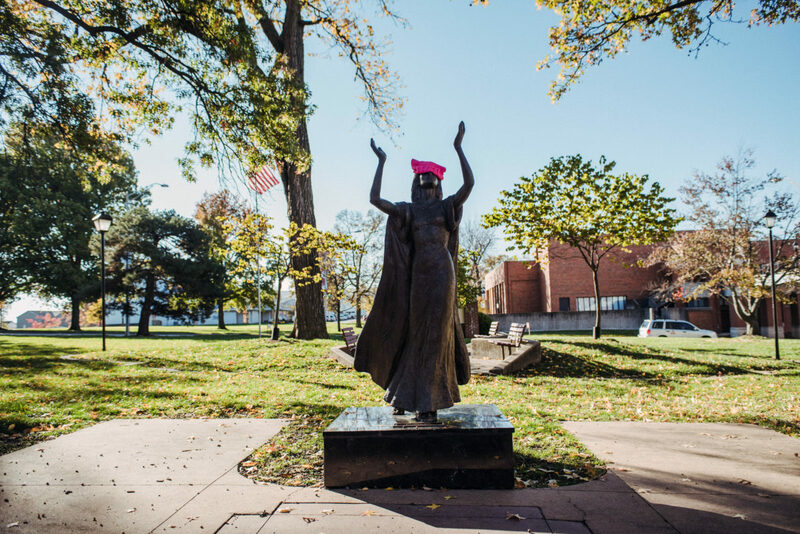 A pink hat, representative of the ones worn by protestors in the 2016 Women's March, was placed on a statue outside of a polling place at Stephens College in Columbia, Missouri. 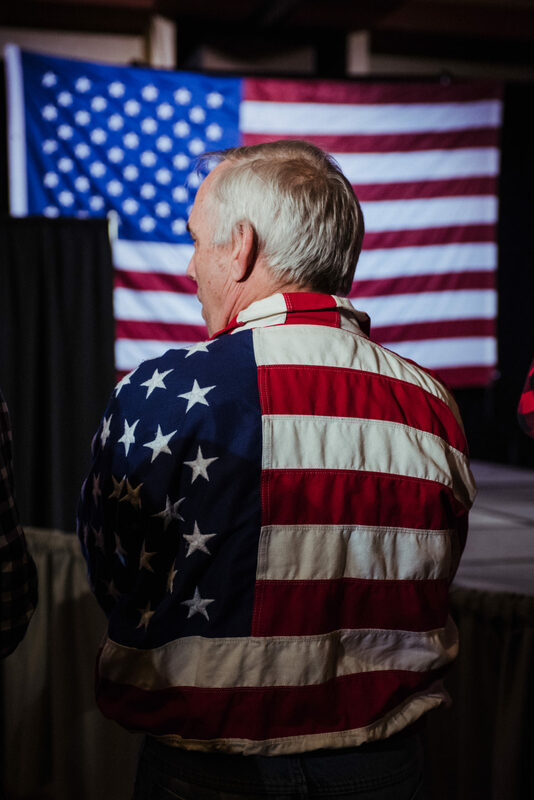 A man wears a short of an American flag at the election party for Republican U.S. Senate candidate, Josh Hawley, at the University Plaza Convention Center in Springfield, Missouri. 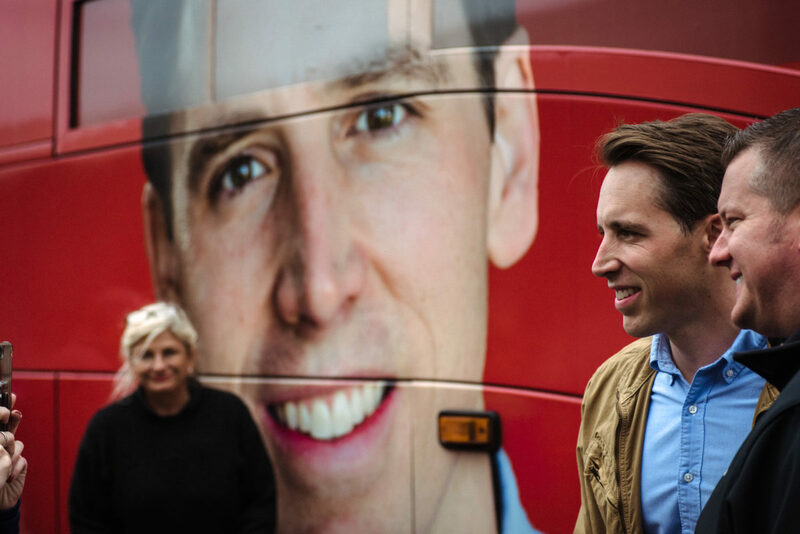 Josh Hawley, right, poses for a picture with a supporter in front of the Hawley campaign tour bus, outside a campaign stop at the Jefferson County GOP field office. 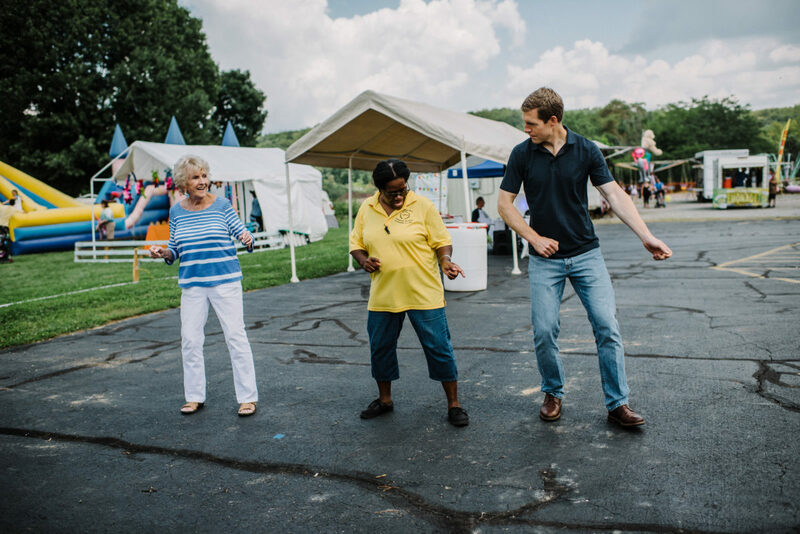 Pennsylvania House representative, Conor Lamb, right, dances with Janet Johns, left, and Janice Cain, center, at Conway Community Day. 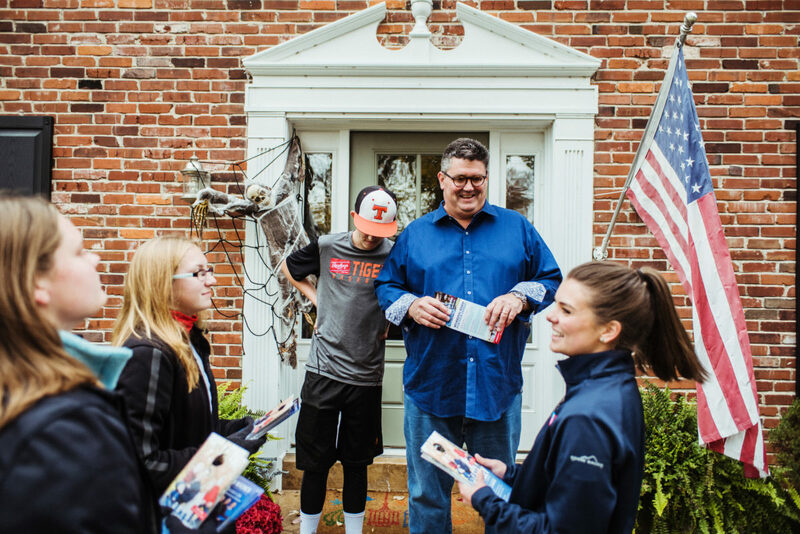 Mr. Lamb toured the state while campaigning for the 2018 midterm elections. 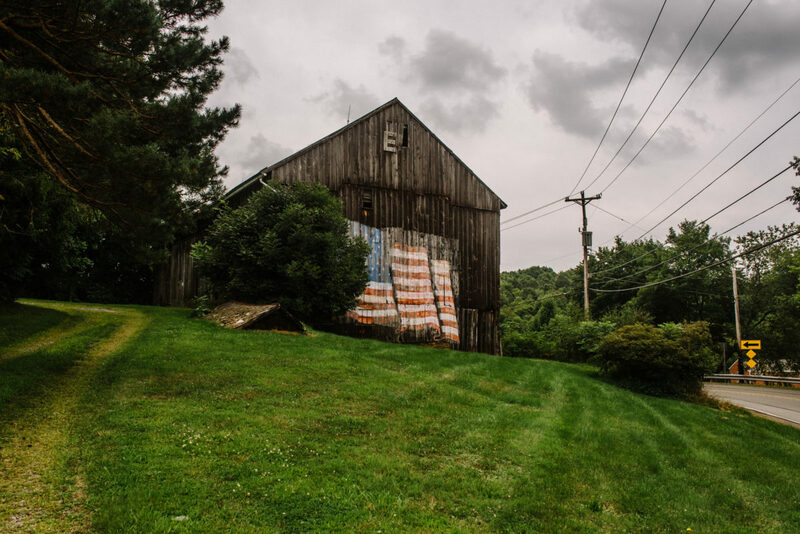 A painted with an American flag barn in Gibsonia, outside of Pittsburgh. 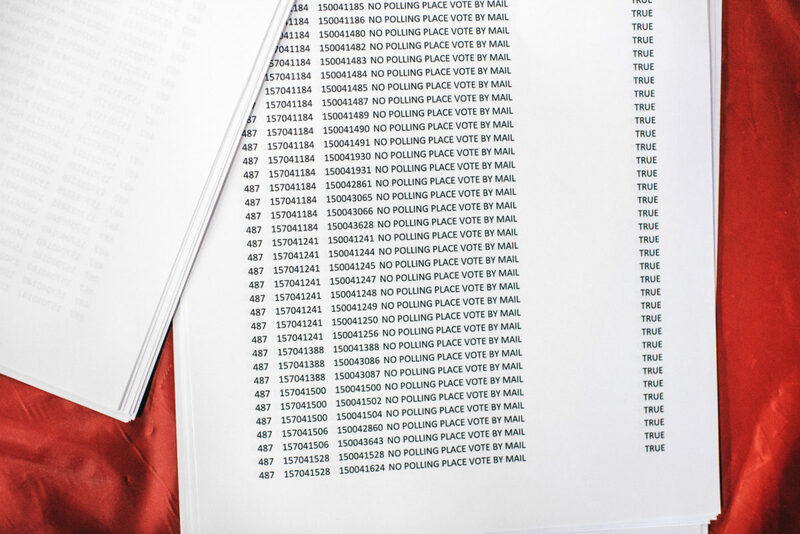 Many precincts in the 21st district are so sparsely populated that there are no polling places, and votes are only accepted by absentee ballot by mail. Here, voter registration lists can be seen at the headquarters for California Republican house candidate, David Valadao. 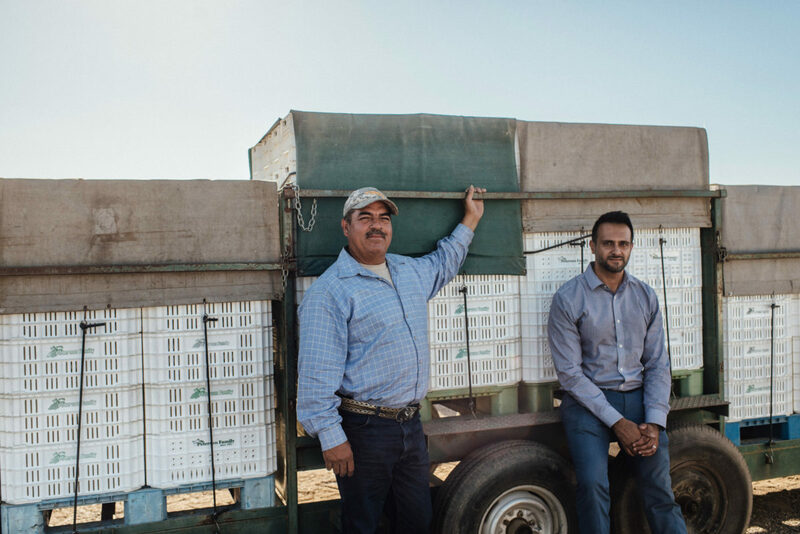 Luis Martinez, farm manager, left, and Shally Gill, right, farm owner, at Mr. Gill's family farm in Kingsburg in the 21st Congressional district. The histrict is heavily agricultural, and in 2018's midterm elections Democrat T.J. Cox beat out Republican incumbent and local farmer, David Valadao. 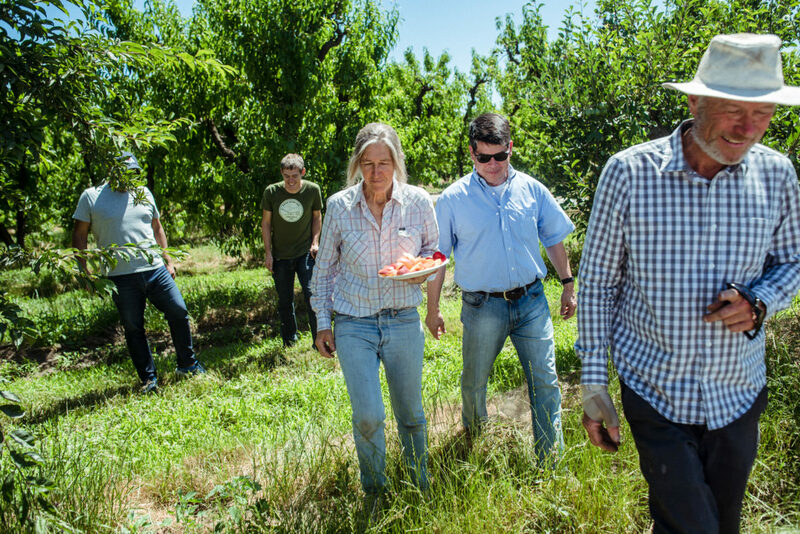 Farmer, Dorothy De Boldt, center, walks with T.J. Cox, second from far right, and David De Boldt, far right, at D.E. De Boldt Farms in Parlier, California. 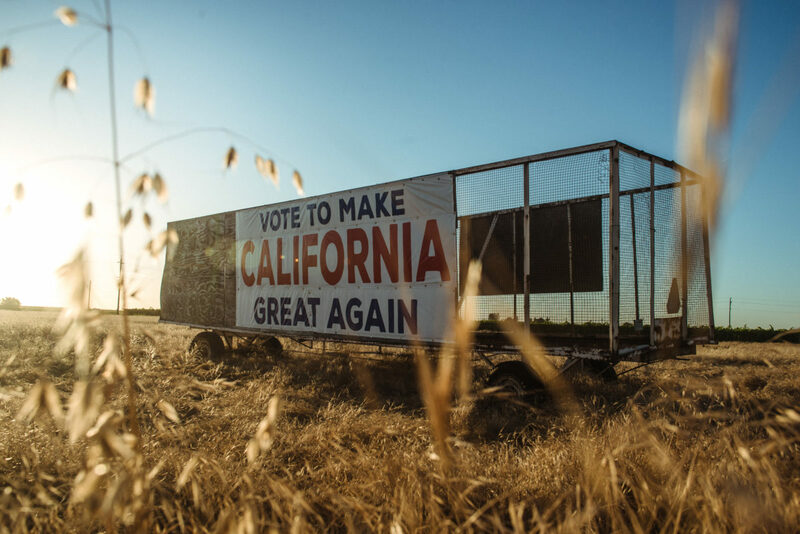 A sign that says "Vote to make California great again" on Highway 43 outside of Hanford. 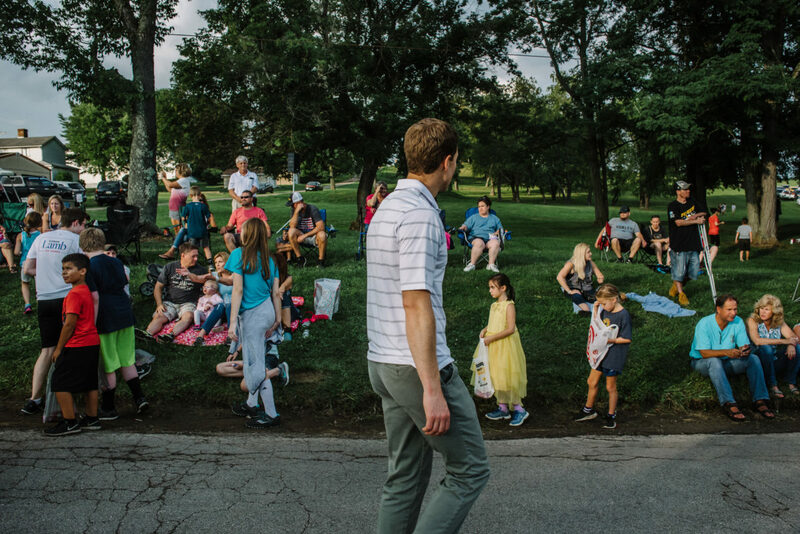 Democratic Representative, Conor Lamb, makes a campaign stop a the West Deer Community Day Parade in Bairdford, Pennsylvania. 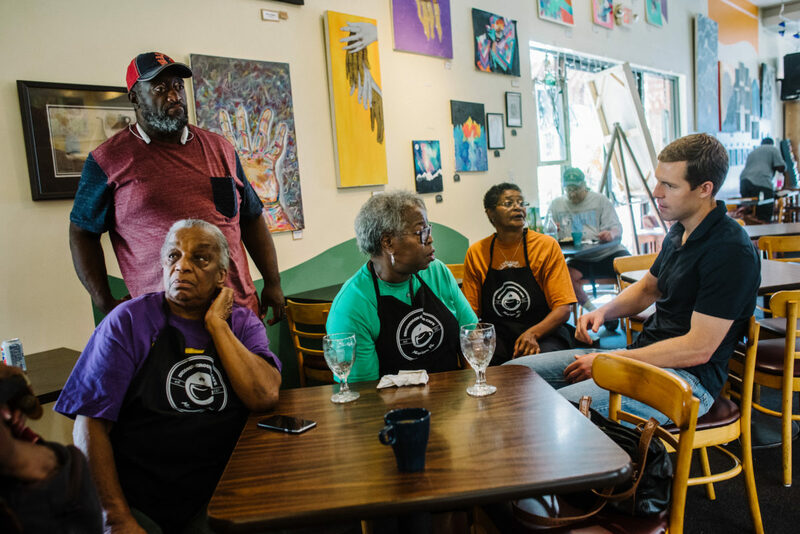 Conor Lamb talks with volunteers at a monthly veteran's breakfast at Uncommon Grounds coffee shop in Aliquippa. 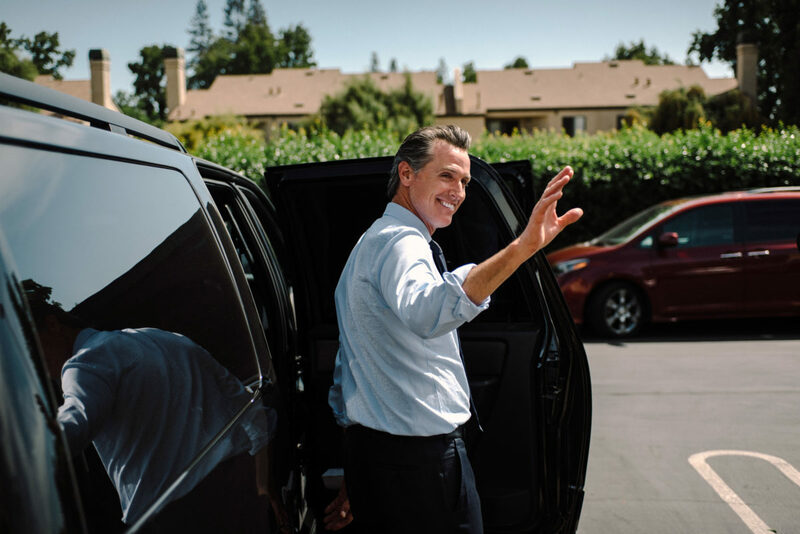 California governor Gavin Newsom makes a campaign stop at the campaign headquarters for Josh Harder in Modesto, California. 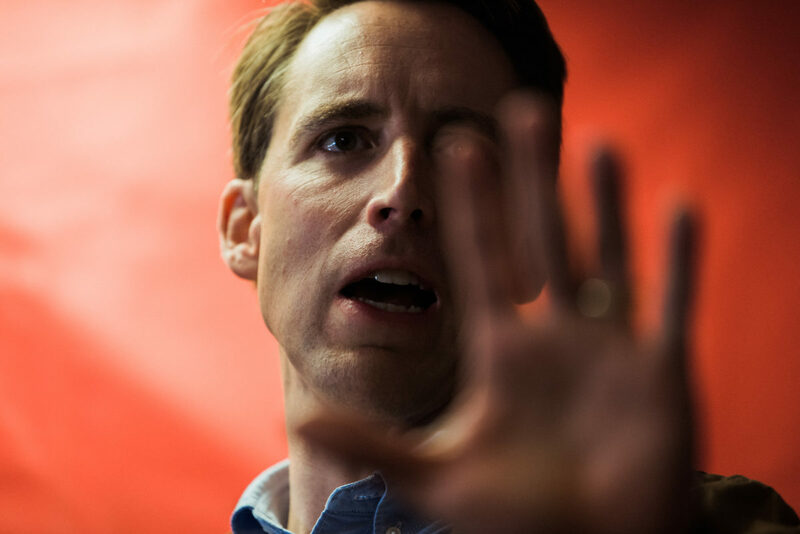 Republican U.S. Senate candidate, Josh Hawley, speaks to a crowd of supporters at the Missouri GOP headquarters in Jefferson City. 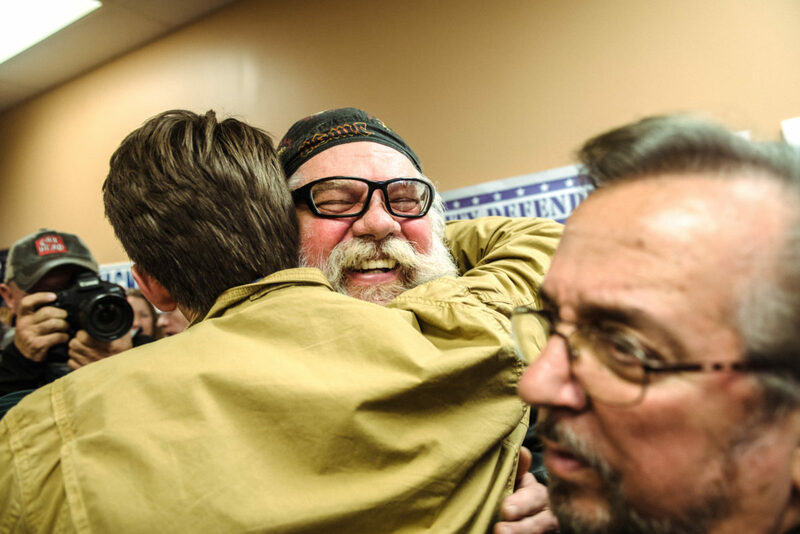 Mr. Hawley went on to win the the seat, beating out Democratic incumbent Claire McCaskill. 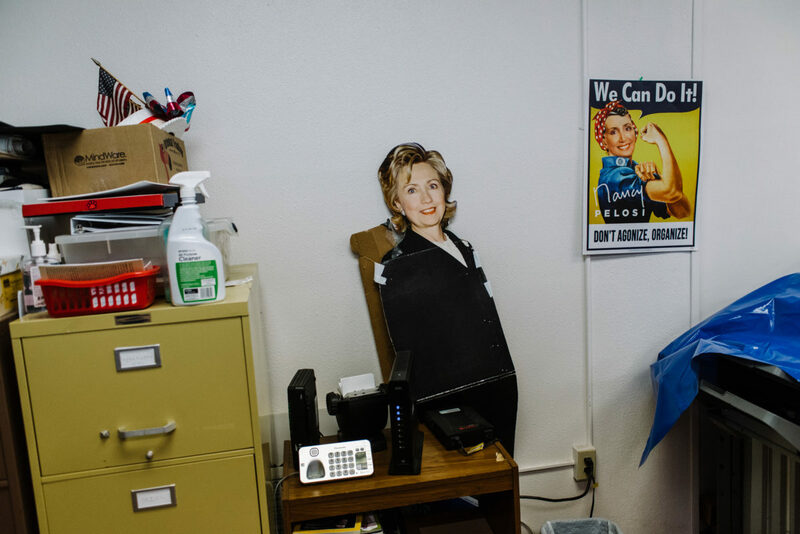 A cutout of Hilary Clinton at the Democratic Party Headquarters in Fresno. 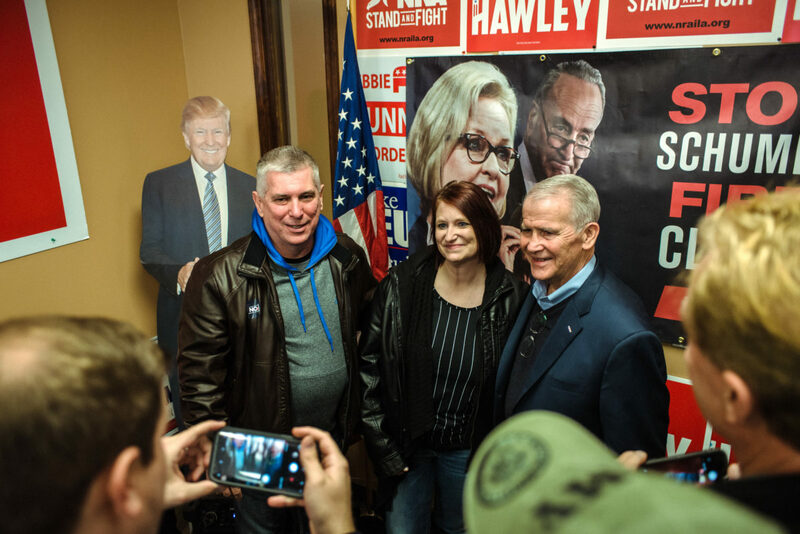 NRA President, Oliver North, right, poses for a picture with supporters at a "Stop Schumer, Fire Claire" campaign stop for Josh Hawley at the Jefferson County GOP field office. 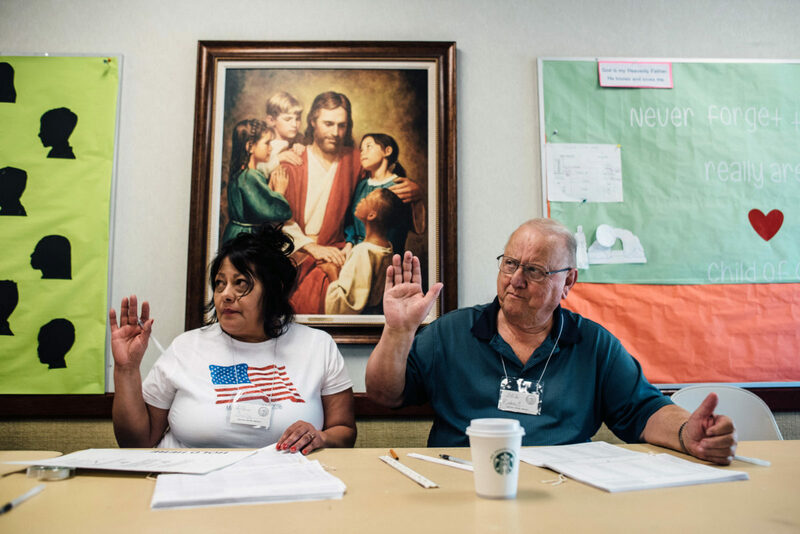 Election day volunteers, Cecilia Ayala, left, and Robert Simek, right, take an oath at a polling place for Precinct 302 in the 21st Congressional district of California. Josh Hawley, Republican U.S. Senate candidate, left, hugs a supporter at a "Stop Schumer, Fire Claire" campaign stop at the Jefferson County GOP field office. 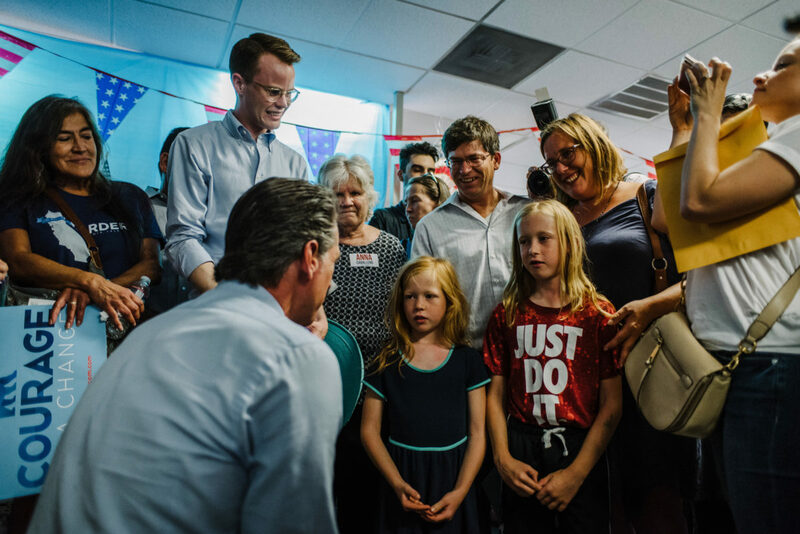 Gavin Newsom talks to Ruthie Roseman, 6, left, and her brother, Meyer Roseman, 8, right, at Josh Harder's campaign headquarters in Modesto. Mr. Newsom went on to win California's governorship in the 2018 midterm elections. A podium for Republican U.S. Senate candidate, Josh Hawley, for a campaign stop at the Missouri GOP headquarters in Jefferson City. 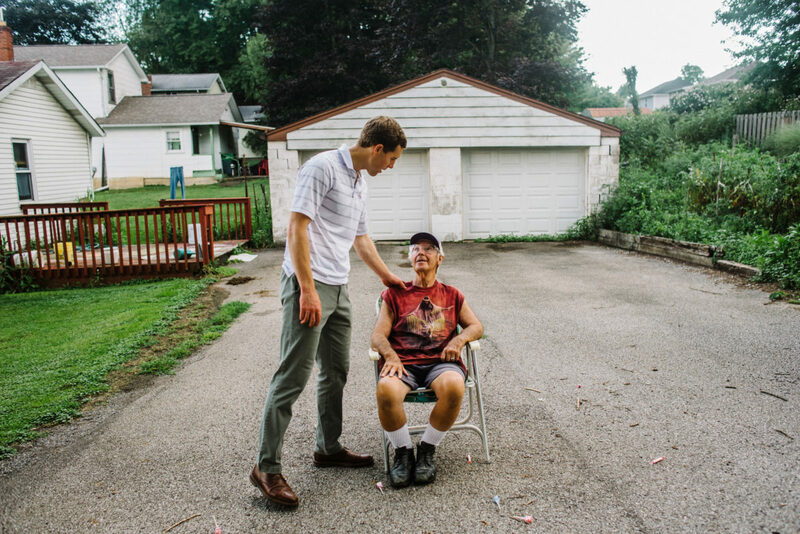 Volunteers for the Josh Hawley campaign speak to Scott Thomas, center in blue shirt, and his son, Tucker, at their home in Chesterfield, Missouri. Democratic House candidate, Conor Lamb, talks to a resident at the West Deer Community Day Parade in Bairdford. 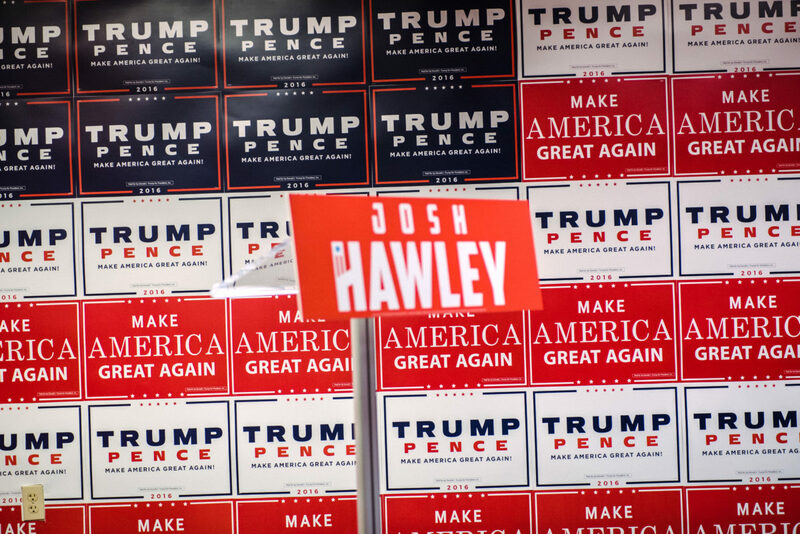 Hawley supporters at the election party for Republican U.S. Senate candidate, Josh Hawley, at the University Plaza Convention Center in Springfield, Missouri. 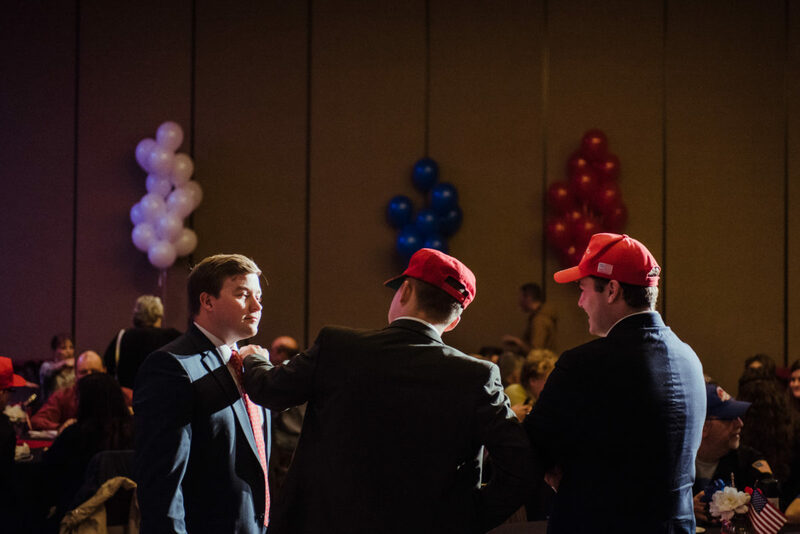 Cory Collins, center, cheers as Josh Hawley is announced to have won the Missouri Senate seat, at the election party for Josh Hawley at the University Plaza Convention Center in Springfield, Missouri. 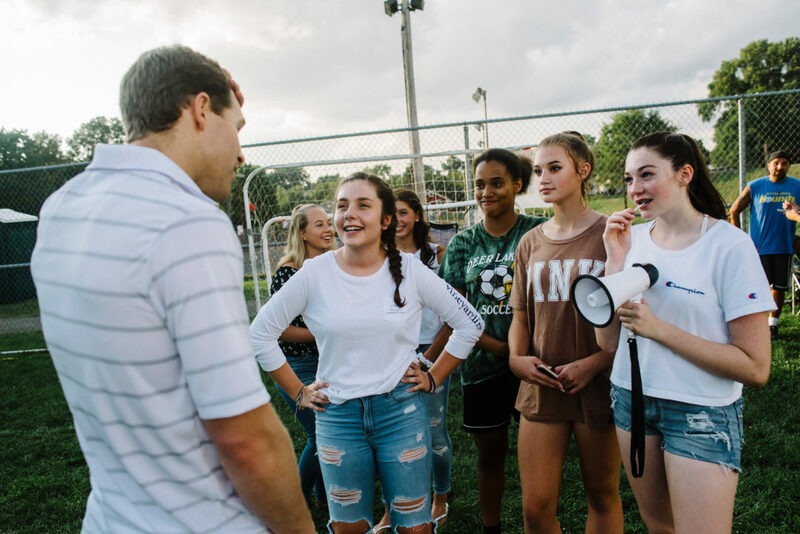 Democratic House candidate, Conor Lamb, talks to a resident at the West Deer Community Day Parade in Bairdford.Conor Lamb talks to Deer Lakes High School students at Bairdford Park for the West Deer Community Day Parade. 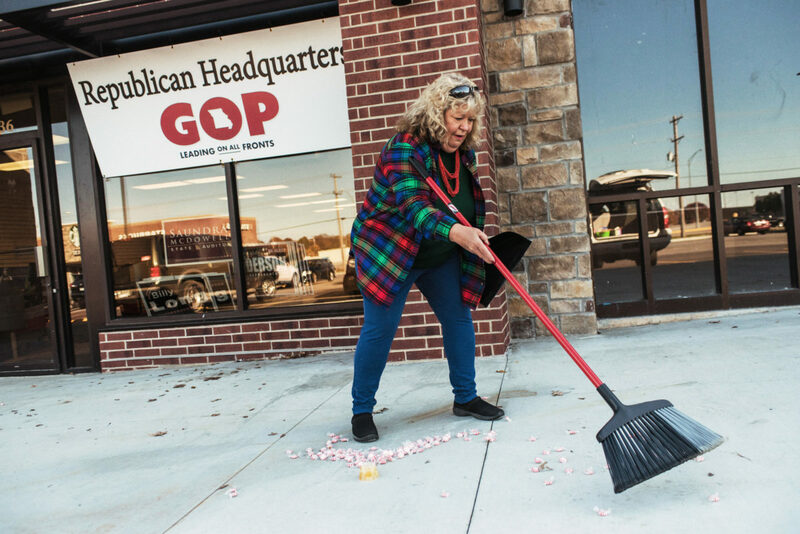 Danette Proctor cleans up at the GOP field office in Springfield, Missouri, the day after Josh Hawley won the Missouri Senate race. Conor Lamb at the West Deer Community Day Parade in Bairdford. In 2018 I worked in California, Pennsylvania, and Missouri covering the 2018 midterm election campaign for The New York Times. 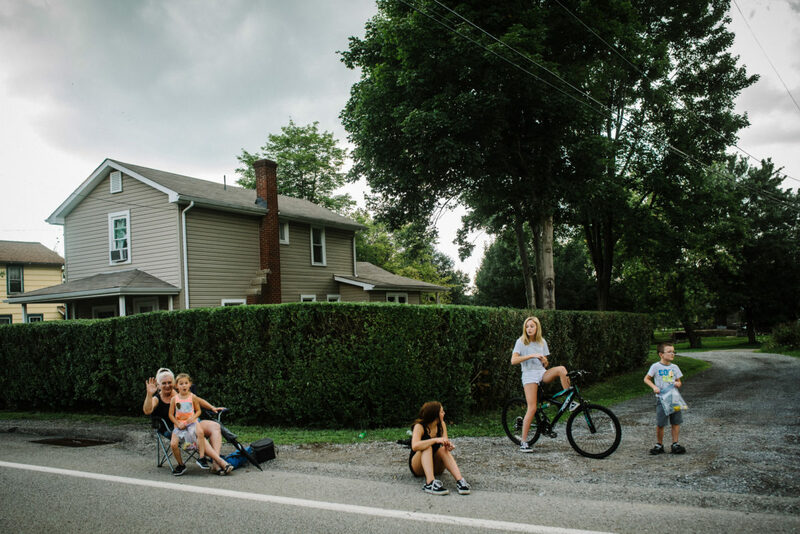 I covered mostly rural, suburban, and agricultural regions of the country, and there I witnessed differing visions of how Americans understood their future and their country. America’s rural regions are often painted as monoliths fighting for tradition in a progressive world, but it is neither fair nor accurate to paint with such wide strokes. This is a gallery of both Democrats and Republicans from all parts of the country, where I saw ideological and cultural diversity of all sorts. This is an edit of the different political assignments I photographed in 2018. Throughout the year I followed Conor Lamb (D-PA 17th District), Josh Hawley (R) for a Missouri Senate seat, Gavin Newsom (D) for California governor, and T.J. Cox (D-CA 21st District). In November, I spent election week driving around Missouri, and on election day I covered Hawley voting in Columbia, followed by his victory party in Springfield, Missouri. These are not just photos of politicians giving speeches and shaking hands; they are photos of what these people and places looked and felt like. 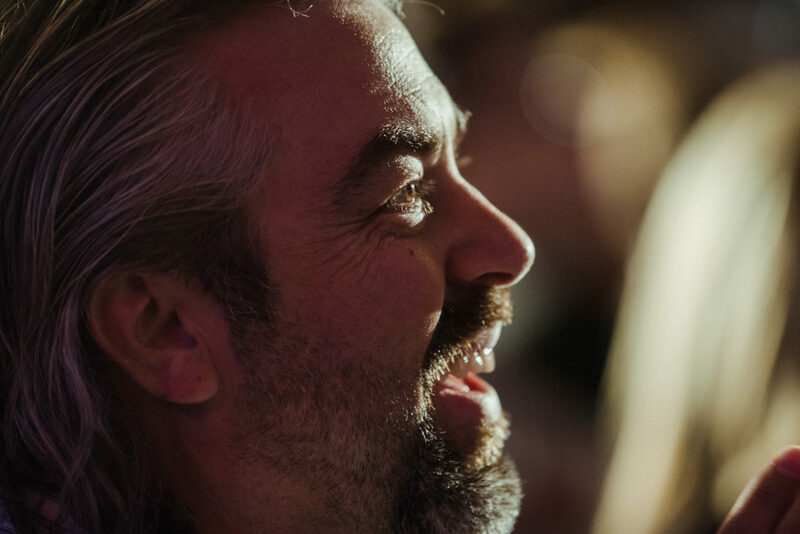 American political theater is quite often a circus, and I instead wanted to show a quieter and more organic dissection of how the people interact with politics. Every candidate I covered ended up winning their respective races, but what was most interesting was feeling the political pulse of the nation at such an important and chaotic time in American history.